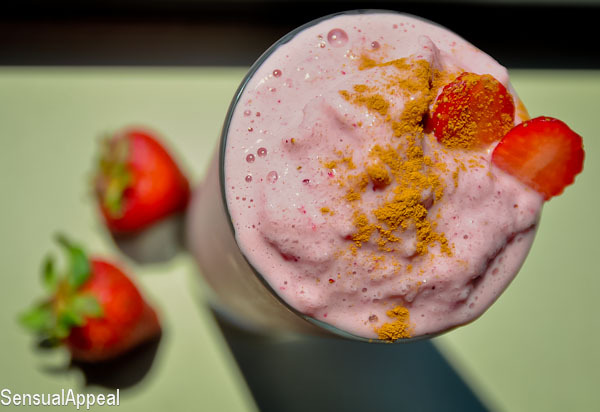 This vegan protein shake recipe is my favorite – this is a Strawberry Cheesecake Protein Shake and it takes the cake. Enjoy! On a beautiful summer day, we are unlikely to crave a rich dessert. We prefer things that are light and fruity. Sometimes though, I’ll crave a certain dessert at night and then the craving simply doesn’t go away and I’m stuck with this strange random craving in the middle of the day – strawberry cheesecake? No way, it’s too hot outside for such a decadent creamy dessert, plus I don’t wanna bake a full cheesecake and then be tempted to eat it. So why not stuff that craving into something healthy? Protein shake, perhaps? Perfect. So that’s how Strawberry Cheesecake Protein Shake was created. I did numerous variations, included actual cream cheese in some, included different types of milk (for example, the almond + coconut milk combo, which I’m actually not too crazy about), but this one is the one that I liked the most. Let’s just say, thank GOD I froze a couple of strawberries because fresh strawberries seem to go bad way too quickly. Again, I was faced with some moldy ones this morning; what the heck? It truly upsets me, like, the berries aren’t cheap! I love strawberries as much as the next gal but buying them only for them to go bad 2 days later is getting annoying. Sigh. 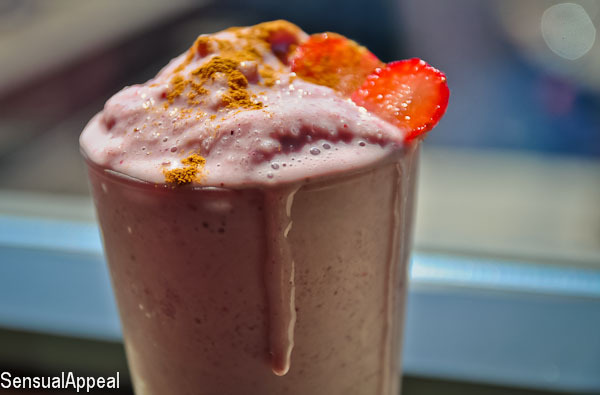 Do you experiment with protein shake combinations? What are your favorites so far? Shared at Slightly Indulgent, Two Cup Tuesday. I need to buy xanthum gum, I would love to get the texture you got out of this. Looks delicious. Creative way to use up some strawberries! Looks amazing! as always, this looks amazing! perfect way to satisfy a craving – I’ve recently been craving raspberry-cheesecake things too but eating a rich dessert like that in this summer heat just is totally nasty. I need to get some gums and try this out! Can I just first off say that your photographer is amazing. 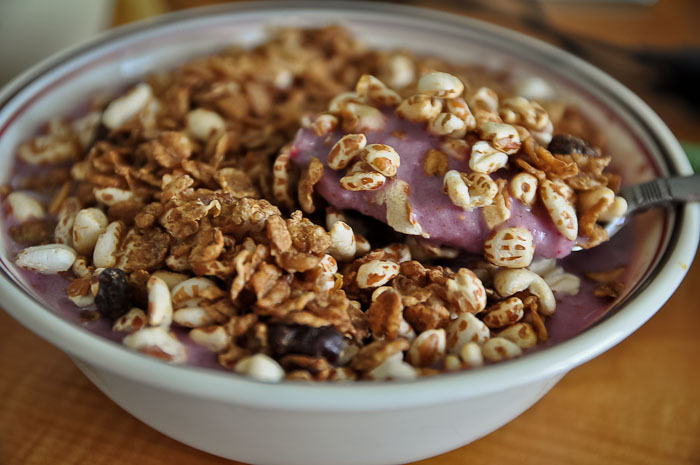 You take unbelievable pictures of your foods! I love this smoothie recipe idea. And actually, I tried the almond coconut and didn’t wasn’t too fond of it, so I went right back to regular unsweetened almond milk. Just a few months ago I discovered xanathum gum and really like it.. just a little totally goes along way. great post! Aww thanks darling! & Yes, I love when a small amount of things can go such a long way! That looks so refreshing, back when I drank unhealthy smoothies I loved strawberry flavored! 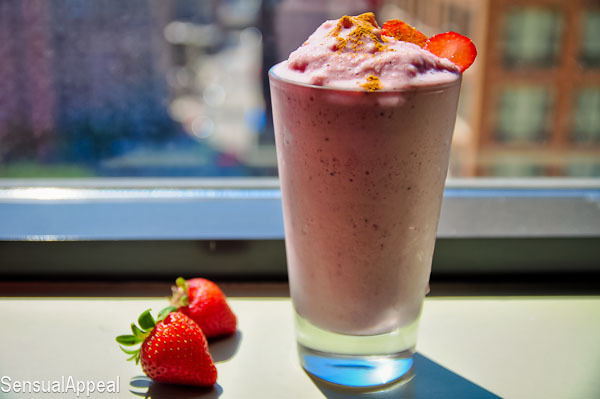 Now that I drink protein shakes I have yet to use strawberries, maybe I’ll try this one! The site looks great! Oh geez, you’re killing me with your beautiful recipes. Gorgeous pictures too, Kammie. This looks delish! Much like the strawberry protein shakes I make but have never tried freeze dried berries in a shake. Wish I had access to them around here. Gorgeous pics. Mmm, this sounds amazing. In fact, all your shakes do. I need to be trying this one. I found your post through the Fresh Foods Blog Hop. Wow, this smoothie looks amazing. I’m always on the look out for new flavor combinations and now I can’t wait to give this a try! Oh wow thank you so much, I did not know about this! Gas absorber, huh? Interesting! I love a good smoothie! Thanks for sharing it at Pint Sized Baker’s Two Cup Tuesday party. I’ve pinned this and I hope to see you again on Monday night! This looks so good, I can almost taste it!